What is the GRE and Why is it Important to Grad Schools? Applying to grad school can sometimes feel like a maze where documents are requested, fees are paid, tests are taken, and essays are written, all without any seeming rhyme or reason. How can you make sense of it all, and be successful in your quest for admission to a graduate program? We’re breaking it down, step by step, and this week, we’ll talk about the GRE: what it is, when to take it, and how to study for it. The one thing everyone knows about applying to grad school is that you have to take the GRE. But what is the GRE? What does it test, when do you take it, what should your score be, and can you study for it? Start by taking a look at our “About The GRE” general overview. Then, read on to find answers to some of the most pressing questions students have about this all-important component of their grad school application. The GRE is the Graduate Record Examination. It is a standardized test required for admission to most graduate schools around the world (and quite a few business schools accept it, too). The GRE is given in both computer-based and paper-based formats, although the computer-based test is the most prevalent; testing centers for the GRE are found around the world. Students are able to take the test during most weekdays and have the ability to select both the date and time to test. The GRE is created and administered by Educational Testing Services (ETS). You can read more about the GRE on the ETS website, here. The GRE is designed to test your knowledge of skills required for success in graduate or business schools. The six-section test takes approximately 3 hours and 45 minutes to complete and measures analytical writing, verbal reasoning, and quantitative reasoning skills. 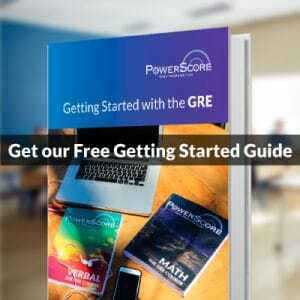 A detailed discussion of the test can be viewed here (on the PowerScore GRE Free Help Area), and you can see what ETS has to say about the general structure and content of the test here. Try to take the GRE about a year prior to your expected entrance into Graduate School—preferably any time during the summer or early fall. The deadline for taking the GRE will vary dramatically depending on the admission procedures of each school to which you apply, the specific program, and the term in which you are planning to enroll. You need to look at the application guidelines to find out whether you need to take a Subject Test in addition to the General Test. These tests are only offered three times a year, so factor their schedule into your timeline. At a minimum, you want to take the GRE six weeks before the application deadline. Because the Writing Assessment is now part of the General Test as the analytical writing section, you will not receive your complete score at the testing center. Because of the essay scoring process, you will only receive the unofficial verbal and quantitative scores at the test center. Your analytical writing score will be sent, along with your official verbal and quantitative scores, within 10-15 days. Scores for the Subject Test, which is given in paper and pencil format, are usually reported about six weeks after you take the test. You can arrange for your test score to be sent directly to you and up to 4 schools in which you are applying. You can read more about when to take the GRE on our Free Help Area, here. What should your GRE score be? An Analytical Writing score reported on a 0-6 score scale, in half-point increments. *Note, scores for these sections used to be reported on a 200-800 score scale, in 10-point increments. When the Revised GRE went into effect, the scoring for these sections changed. Schools are forthcoming in providing students with the scale of scores for their most recent incoming class. This information can typically be found in the incoming class profiles at each of the school’s websites. U. S. News & World Report also lists these average GRE scores as part of their Graduate School Compass (a subscription service), which is accessible through their Graduate School Rankings. Take the time to research the GRE scores for the schools you are interested in; in this way, you can keep track of how close you are to the necessary score whenever you take practice tests. Can you study for the GRE? Absolutely! In fact, you should. Because the GRE is a standardized test, its content and question types can be analyzed, and you can get better at answering them over time. Studying for the GRE can be time-consuming, but rewarding–we have seen our students increase their scores dramatically (and, therefore, increase their chances of getting accepted into a more prestigious, higher-ranked program). There are many ways in which you can study for the GRE: Courses (long, short, and online), books (used for studying on your own), and tutoring. ETS also offers free study resources you can use to start your prep. 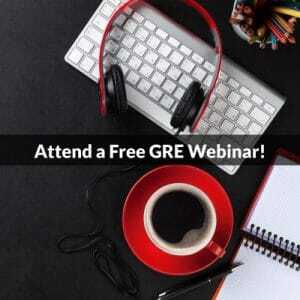 The GRE is a pivotal part of your grad school application, but it doesn’t have to be intimating. Take the time to get informed about the test, do research on what schools are looking for in your score, and start studying, and you’ll increase your chances of scoring high and maxing out your chances of getting into your top choice school.